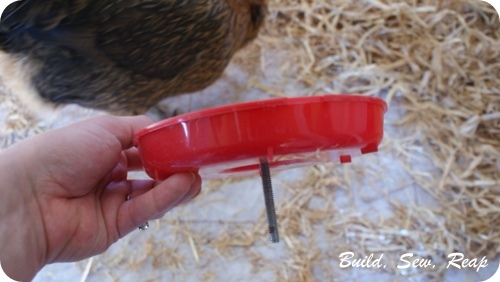 If you've ever had chickens, you know they're pretty determined to tip over their feeder or at least dump as much expensive organic layer pellet feed as they can. 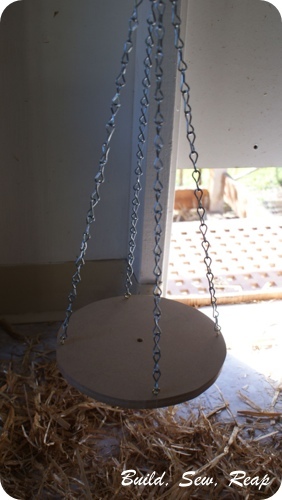 I decided that I am indeed smarter than a chicken so I devised this hanging feeder that they can't tip over. I'll let the pictures mostly just speak for themselves. There's a long bolt that sticks through the hanging disk. This bolt does not screw in to the wood, it merely sticks through a drilled hole. This screw is what keeps the feeder from tipping over. 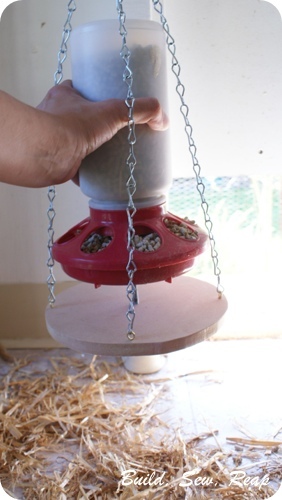 Loading it into place is as easy as lining up the bolt with the hole in the wood and setting the feeder into place. 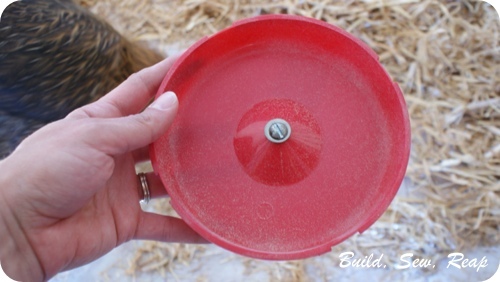 I pre drilled the appropriate size hole right in the center of the base of the feeder. I threaded the bolt through that hole with a washer to ensure it wouldn't pull through. I then threaded a nut up from the bottom and tightened it in place underneath. 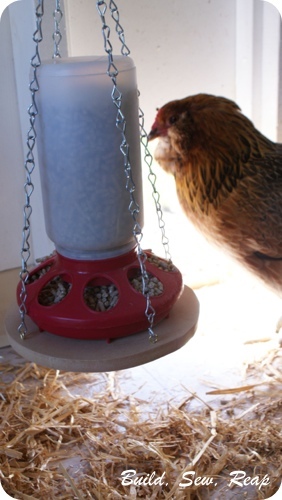 This has been in place for several days now and I'm seeing a lot fewer wasted pellets and I'm not constantly annoyed by all the hay they kick onto their feeder (it hangs several inches off the floor of the coop now). 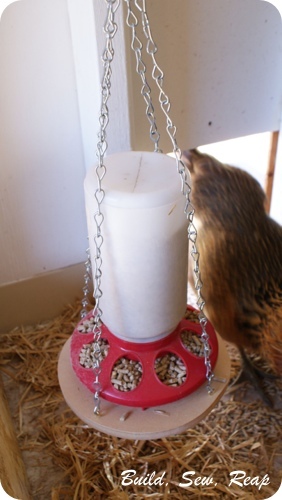 As an added bonus, it isn't as accessible to the rat that tried to get to the feeder through the chicken wire. We ran him out and made sure all feed and bedding was safely locked in bins but even if he comes back, he can't get to the feeder. This post is exactly what I need. I'm always confused about the way I feed my chicken. Thanks for your nice sharing. 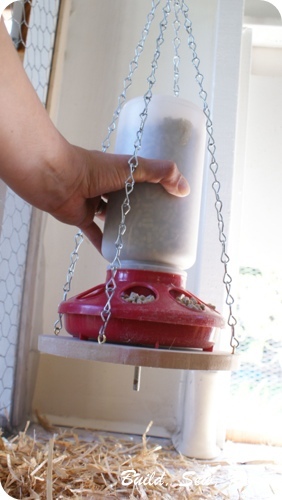 I've just found out that I've feed my chicks in a wrong way.Now I will solve it. Thank you.